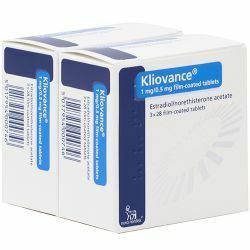 Novofem (Estradiol/Norethisterone) Tablets 84 is a sequential combined Hormone Replacement Therapy (HRT). It is taken every day without interruption. 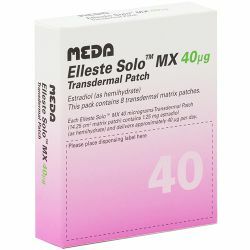 It contains two female hormones an Oestrogen-Estradiol and a Progestagen-Norethisterone. 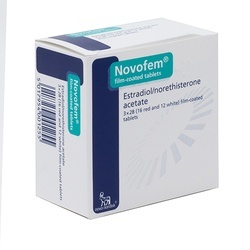 Novofem is used for the relief of symptoms occuring after menopause and prevention of osteoporosis. Always take this medication exactly as instructed by your doctor. Please read the patient information leaflet before use. One tablet to be swallowed whole with a glass of water once a day, about the same time each day. Days 1-16 take one red tablet every day for 16 days, days 17-28 take one white tablet every day for 12 days. Once you have finished the pack, start a new pack continuing the treatment without interruption. A menstrual-like bleeding (period) usually occurs at the beginning of a new pack. 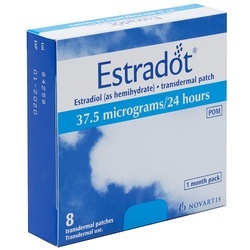 The active ingredients in Novofem (Estradiol/Norethisterone) Tablets 84 are Estradiol 1mg and Norethisterone 1mg. The other ingredients are Lactose Monohydrate, Maize Starch, Hydroxypropylcellulose, Talc, Magnesium Stearate, Hypromellose, Titanium Dioxide (E171), Propylene Glycol, Red Iron Oxide (E172), Triacetin. Please read the patient information leaflet before starting this medicine. Like all medicines, this medicine can have side effects, although not everybody gets them. If you experience any of the side effects listed in the patient information leaflet or not listed in the leaflet please consult your doctor or pharmacist. Novofem should not be taken if you are pregnant or breastfeeding. Do not take this medication if you are allergic to any of the ingredients. Please give your doctor a full medical history to ensure that the appropriate medication is prescribed.